Will species adapt to climate change? One common misconception about evolution is that organisms will adapt in response to human-caused environmental changes, such as habitat loss and ocean warming. But if species do not have the traits that will allow them to survive and reproduce under different conditions, they may go extinct. In other words, species need to have the kind of genes that will be advantageous in the new environmental conditions. This way they will be able to adapt and persist. 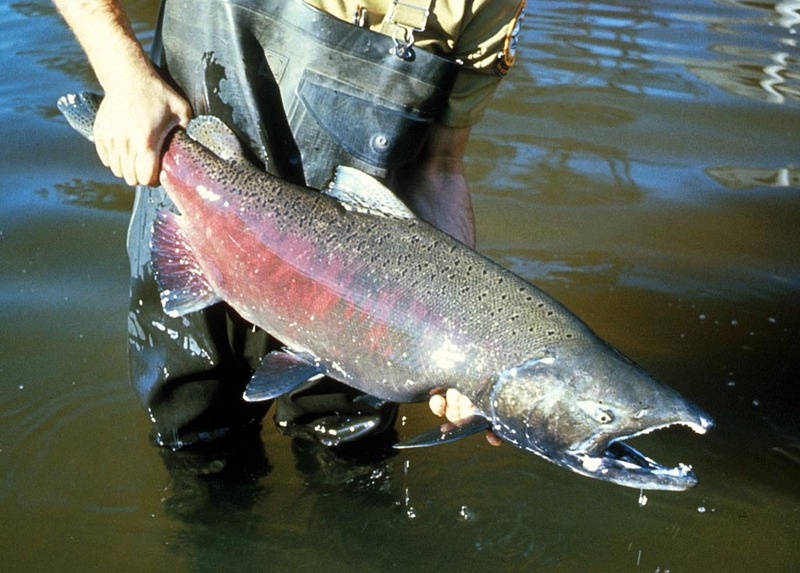 The Chinook salmon (Oncorhynchus tshawytscha; Figure 1) is an important food source not only for humans (it is widely caught in North America and Asia) but also for marine mammals such as the endangered killer whale (Orcinus orca). Salmon species have complex life cycles and are migratory. Consequently, the impacts of environmental change are particularly alarming for these species as the pressure might be different among environments they pass through. Habitat loss of the Chinook salmon is in part attributed to increasing sea surface temperature (estimated to increase ~0.1 – 0.6°C per decade). This not only concerns conservationists, but fisheries managers and governments as well. Little is known about how organisms respond to their changing environments at the genetic level therefore studies are essential for management and conservation efforts. In this study, Everett and Seeb (2014) attempted to find regions of the DNA of the Chinook salmon that are linked to observable traits or characteristics of the species. Identifying regions of the DNA that are associated with ecological traits such as thermotolerance (temperature tolerance) is particularly important for species conservation in the light of the predicted sea temperature rise. Therefore, the authors planned an experiment to find regions of the DNA associated with thermotolerance and body size. This method is known as quantitative trait loci (QTL) analysis – you can find more information here. The authors used six females and three males to make pairs of half-sib families, i.e. individuals that have one parent in common like half-brothers or half-sisters. The siblings were then subjected to a temperature experiment and over the course of 1h the authors increased water temperatures from 18°C to 25°C. The individuals that showed signs of a loss in equilibrium were recorded as temperature sensitive and euthanized for analyses. Individuals that did not show equilibrium loss were recorded as temperature tolerant and also euthanized. Fifty individuals were analyzed from each family for each type of response (temperature sensitive/tolerant). In addition, all individuals were measured and weighed for the discovery of traits associated with body size. After extracting the DNA from all the individuals, the authors used a type of markers called single nucleotide polymorphisms -SNPs (read more here). They were then able to identify three significant QTLs for temperature tolerance (see Figure 2 for an example) and a significant QTL for body size. Figure 2: The distribution of significant values for thermotolerance in the female parents. The dark horizontal line is the experiment-wide (P < 0.05) significance limit. The vertical line highlighted by the red circle represents a peak of a QTL (quantitative trait locus) for thermotolerance. 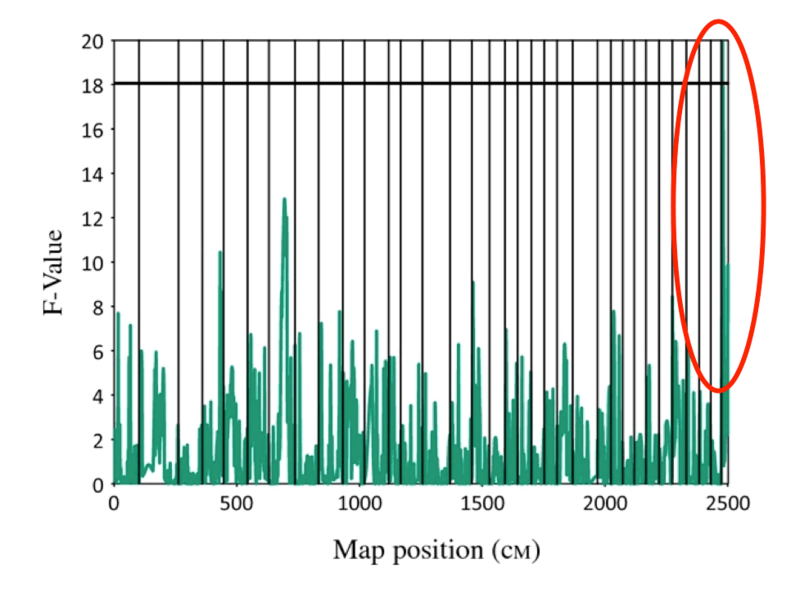 Map position (x-axis) refers to the distance between the locations of genes. As climate changes, some species may be able to move to different habitats to remain in suitable conditions. Other species may be able to adapt if some of their populations have favorable traits for survival. However, predictions indicate a fast increase in warming rates from 0.1–0.6°C per decade in the Pacific Northwest corridor of North America. This will modify, for example, the snow pack, seasonal river flows and water quality at an extraordinary speed. Consequently, in just a few decades many species will be threatened by habitat fragmentation and loss. The way that species will respond to climate change depends greatly on their genes. It is crucial to understand the mechanisms that give a species the potential to adapt. As an example, studies like this one will allow us to predict how different populations will respond to the effects of warmer sea temperatures and which ones will be more or less vulnerable based on their genetic makeup.